Measuring PR, is AVE out of date? Advertising Equivalency (AVE), a measurement tool calculating the amount that editorial coverage would have cost had it been placed as advertising, has been challenged on its use and effectiveness for as long as it has existed. 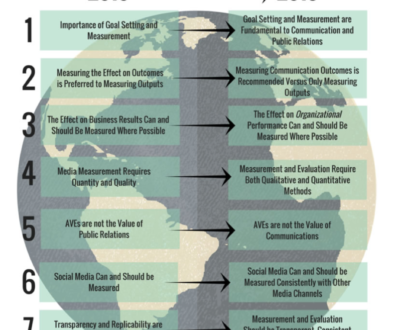 Often seen as a red herring to those measuring PR campaigns, AVE is a component of the PR world that is regarded with equal measures of disdain and acceptance by industry professionals. The beauty of AVE is its simplicity, a monetary figure highlighting the return on investment, exceeding that which could have been achieved by splashing out on advertising. This can seem like a no-brainer, crucially to board members and financial directors responsible for justifying budget allocations. It is argued however that public relations is not advertising, so how can it be an accurate comparison of value? AVE is also criticised for its lack of depth as an analytic. How can you tell the value of an editorial placement by the size alone? A half page in a magazine does not necessarily denote half a page worth of sales or positivity towards your company brand, or worse still, it could be negative. Being in an industry that has reputation management at its core, it is never going to find it easy to quantify itself categorically in objective terms; however many see AVE as reassuring and conclusive, it’s the bridge from the intangible to the tangible, and that is hard to dispute. Principles aside, let’s look at the reality of AVE. Even though it is subject to this criticism there is no reason why AVE can’t form part of any campaign to demonstrate what results are taking place. It can subsequently add to a wider analysis breaking it down by target media, target features, geographical preferences and positive and negative attitudes along with a plethora of other analytical options. Despite reputation management being subjective by nature, PR is bound by the same measurement as any other organisation and will always be valued in terms of its effect on the bottom line. As long as board members and financial directors are asking for ROI figures to justify marketing budgets, AVE will continue to be worthwhile. PR | Have you heard about Barcelona?